Be aware that many streams and rivers have been seeing midday water temperatures in the high 60s. Thatâs approaching the threshold of 70 when anglers, especially catch and release folks, should limit their fishing to mornings or early afternoons or, better yet, fish waters with cooler temperatures. As we move into August, many anglers find the fishing slows. There are several possible reasons for this. One, there’s an abundance of food, so the fish can afford to be picky. Further, trout have been exposed to a large number of manmade “food” items, and fish do tend to become a bit more wary. Savvy anglers adjust by fishing less-pressured waters and trying new tactics (time, location, lure/fly/bait and presentations). South Park waters have been seeing a lot of pressure these recent weeks, but some waters continue to produce well. Jefferson Lake is worth the drive if you’re looking for fast action. While baits are popular, the fly-fishers, either long rods or spinning with fly and a bubble, have been doing best, as there’s been plenty of surface action. Any small pattern in black or peacock has a good chance of working. One Tarryall angler changed up his colors and has found that wine-colored woolly buggers work well. Elevenmile fishers have found the weeds to be both a boon for their fish attraction and a pain, as fouled hooks are common. Consider using either floats or floating jigs to help keep your baits just above submerged vegetation. The Dream Stream will be seeing work Monday through Thursday from now into the fall. Stream improvement work is taking place. While that bodes well for the future, the construction work will be disruptive to the fishery. Anglers are encouraged to fish other places. Sylvan Lake keeps popping up as a good place to fish. Baits have been producing to a degree during the heat of the day, but early morning and evenings are time for flies. For those fishing from boats and canoes, consider trolling flies, an oft-overlooked technique that can be deadly at times. Other than the Colorado River around Glenwood Springs, most area rivers are prime at this time. Flows are perfect for wading, and fishing is steady throughout the day. While this is a great time for dry flies, caddis, quills, blue duns, yellow stones and terrestrials, anglers should also consider nymph fishing and streamers when there’s no obvious hatch. Be aware that many streams and rivers have been seeing midday water temperatures in the high 60s. 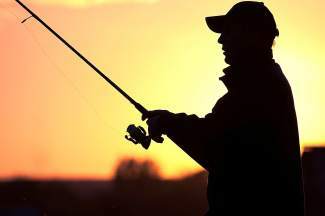 That’s approaching the threshold of 70, when anglers, especially catch-and-release folks, should limit their fishing to mornings or early afternoons or, better yet, fish waters with cooler temperatures. The stress during high water temperatures has the potential to be fatal.